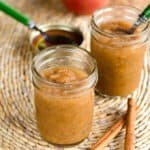 An easy 3-ingredient crock pot applesauce recipe with no added sugar. Oil crock pot with coconut oil. Core, peel and quarter apples. Add to crock pot with cinnamon stick. Cook on low 6 - 8 hours, until soft. Remove cinnamon stick. Mash apples or puree with immersion blender.